Tiaras, Tantrums & Martinis: Merry "Spring"! Ok, so here's where I'm at: I have 2 sick kids who have had a fever since Sunday. It's now Thursday. (I just had to check my calendar to make sure that it is indeed, Thursday....this is like the Bermuda Triangle of cabin fever.) They turned the corner yesterday and are feeling much better today, but still not 100%. We've been stuck in the house since Sunday. 4 DAYS, people. I'm losing my mind!! I'm following this Malaysian Jet mystery like it's a soap opera and obsessively tracking my Amazon.com order of the movie Frozen waiting for that bugger to show up because I can't watch one more episode of Doc McStuffin's patching up a talking inanimate object while her little diva sidekick Lambie whines because she doesn't feel special anymore & starts acting out passive aggressively. Maybe Doc's parents need to start paying a little more attention to her stuffed animal medical clinic before Doc has a psychotic break and starts operating on neighborhood kids. To add a kicker to the feeling that I'm in the movie Groundhog Day and reliving the same day over and over...today is the first day of "Spring". I use the term loosely since it feels the same as any other January day. Ok,ok -that's a bit dramatic....maybe more like early February. "Spring"....pffffffft! If by "Spring" you mean dead grass, baron wilted trees that may or may not ever bloom EVER again, and temps in the 30's...then yes, it's Spring. Indeed, "Spring has Sprung". Put on your winter coats & earmuffs....Spring is here. I've NEVER - in my 29 years on this earth - EVER seen anything like this never ending winter!!! In an effort to shake things up, I've just filled out my college basketball bracket for March Madness. I have no idea whatsoever what I'm doing, nor do I have any clue who any of these teams are, but I needed a distraction. I picked the teams based on random things like...which place would I like to visit more than the other, or if I know someone who knows someone who went to one of the schools. When in doubt, I just picked in alphabetical order. Very scientific. Who knows, I may even start watching the actual games. When's kickoff?? Next I may sign up at the University of Phoenix Online and get a doctorate degree in Anthropology or Cardiology. One of the "ology's" for sure. Ferretology? I definitely don't need one in meteorology...no, no need for weatherman degree when I can already predict it will be Winter forever. And on that note...I'm off to grease up the old snowboard in anticipation for the next snowfall. 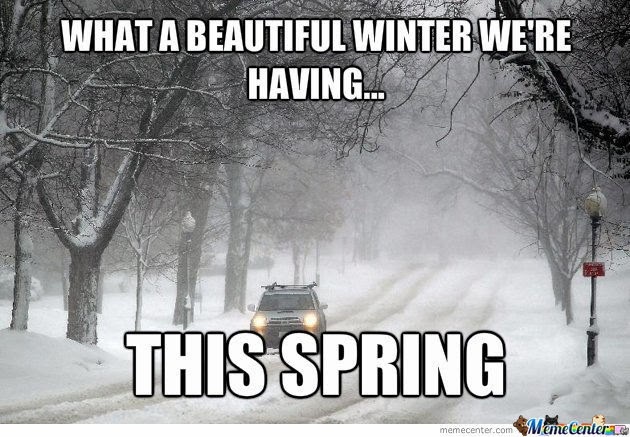 Happy "Spring"!! !